Before becoming Circulation Supervisor here at the Burke Library, I attended Union Theological Seminary in the City of New York (UTS-NYC) as a Master of Divinity student with a focus in Interreligious Engagement. My particular area of academic research lies in two distinct segments of scholarship; 1) Judeo-Christian relations in Late Antiquity, and 2) the modern conflict in Israel/Palestine. Before arriving at UTS-NYC I attended Louisville Presbyterian Theological Seminary at graduated in May 2014 with a MA in Religious Thought. In January 2014 I participated in a month-long travel seminar to the Holy Land, sparking an interest that has grown substantially. When I visited Israel/Palestine in early 2014 I had no idea how much of an impact the trip would have on my continued vocational work. Photos taken in the West Bank, by Deanna Roberts, 1/27/2014. From exploring historic landmarks and ancient ruins throughout the region, to sharing coffee at a local Palestinian cafe next to the wall in Beit Sahour with new friends, the trip changed my life. Beit Sahour is a refugee camp on the eastern side of Bethlehem. When most people hear the term refugee camp, tents and non-permanent structures come to mind. However, in Beit Sahour and the other refugee camps inside the West Bank, which have now been around for well over 60 years, dwellings are quite permanent. The experience I had in the West Bank was eye-opening, insightful, heartbreaking, and joyous. As a citizen of the United States I was able to move freely in and out of checkpoints and through gated areas with little to no questioning from the Israeli Defense Force (IDF) soldiers about my intentions. It became more obvious to me each day just how limited travel is to Palestinians living in both Israel proper and inside the Occupied Territories. What makes things even less black and white, and way more grey is that people living side-by-side one another, or in some cases directly above and below have drastically different sentiments about whose land they are living on. On an “illegal” excursion to Hebron, my privileged position as a US passport carrying citizen became all the more clear. Something interesting about the Holy Land, as in many other places around the world, is that people continuously build on top of more ancient cultures and civilizations. We build our dwellings right on top of the lived realities of those that have come before us. 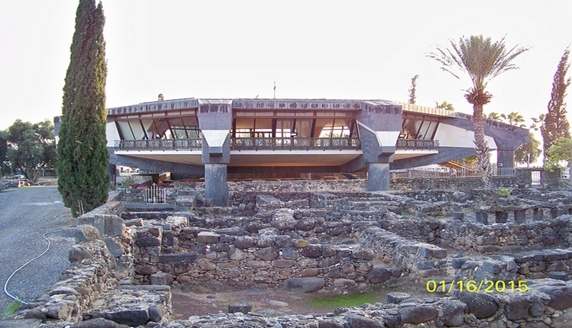 In many instances, international Christian communities like to build churches right on top of historical sites, particularly in the Galilee region. Not only do Christian churches get build on top of ancient Jewish synagogues, but Jewish settler apartment complexes get built right on top of now closed Palestinian homes and storefronts. It became clear to me that the vision that Jewish settlers in the West Bank have for a homeland is in contrast to the vision that Palestinian Arabs, both Christian and Muslim, would have of their homeland. The experiences in Israel/Palestine in 2014 were not all bleak and dreadful. One of my favorite photos from the trip is of me standing inside a church on the Mount of Olives overlooking the borders of the old city of Jerusalem. As I stood there I remember noticing that there was a mesmerizing unity of the cross located on the altar lined up perfectly with the Dome of the Rock, and the Wailing/Western wall that falls directly behind. The moment captured the hope that I have: that people of three faiths can live together in harmony. 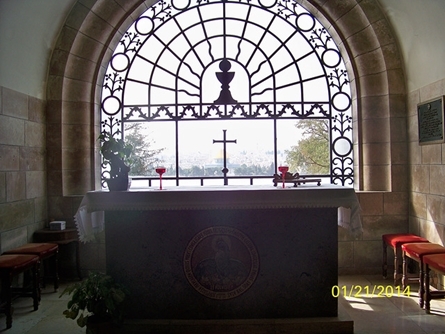 Photo taken inside the Chapel of Dominus Flevit, by Deanna Roberts, 1/21/14. When I arrived back in the States after my trip I found myself unable to put away from my mind the images and stories I had seen and hear while visiting the people that inhabit the land inside historic Palestine. I joined the Israel Palestine Mission network of the Presbyterian Church (USA), moved to Massachusetts to participate in a year of service, and then found myself in NYC following a call to ordained ministry in the PC (USA). Of all the social justice issues swimming around the campus of Union Theological Seminary in the City of New York, the one that is minimally acknowledged is the moral, economic, social, and religious crisis in Israel/Palestine. Photo of “A Palestinian Theology of Liberation: The Bible, Justice, and the Palestine-Israel Conflict,” by Naim Stifan Ateek (New York, Orbis 2017). Located on one of the New Book shelves, this work echos many of the other works by Ateek. 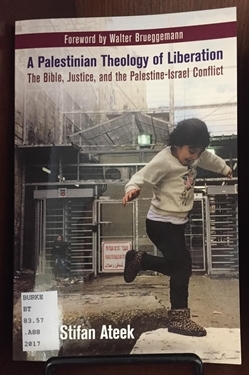 In Burke we also have Justice and Only Justice: A Palestinian Theology of Liberation, and A Palestinian Christian Cry for Reconciliation both authored by Ateek. Also held at Burke are several of the works written by Union Theological Seminary NYC Doctor of Philosophy graduate W. Eugene March including: Israel and the Politics of Land : A Theological Case Study, God’s Land on Loan: Israel, Palestine, and the World, God’s Tapestry: Reading the Bible in a World of Religious Diversity, as well as The Wide Wide Circle of Divine Love: A Biblical Case for Religious Diversity. In addition to these we also hold several books by Mitri Raheb in the wider Columbia Libraries Network, including I Am A Palestinian Christian, Faith in the Faith of Empire, Bethlehem Besieged : Stories of Hope in Times of Trouble, and the recently published The Cross in Contexts : Suffering and Redemption in Palestine has been ordered and will be available at Burke once it arrives. Comprehending Christian Zionism: Perspectives in Comparison, Goran Gunner and Robert O.Smith, editors, 2014. The Biblical Text in the Context of Occupation : Towards a New Hermeneutics of Liberation, Mitri Raheb, editor, 2012. The Gospel and the Land of Promise : Christian Approaches to the Land of the Bible, Philip Church, editor, 2011. What It Means to be Palestinian: Stories of Palestinian Peoplehood, Dina Mater, 2011. Israel/Palestine-related events are happening throughout New York. To highlight one which just closed at the end of February, please see information on traveling exhibit of Bethlehem Beyond the Wall up at Manhattan College in the Bronx. This entry was posted in Circulation & Delivery, Collections, History and tagged Israel/Palestine, Palestine, Travel on March 2, 2018 by Deanna Roberts.